Russia’s Federal Bodyguard Service has dismissed the suggestion that the ongoing restoration works in the Moscow Kremlin would lead to replacement of the famous “ruby stars” with Russian imperial eagles. The fears over the look of the world famous red brick fortress that became the symbol of Russian political power made it to the Lower House of parliament. At a recent session of the Communist Party caucus, MP Vladimir Fedotkin addressed his leaders with a request to do something about the rumors that the red stars that decorate the Kremlin towers will soon be replaced by brass two-headed eagles. “Even if they are only thinking about such a replacement it would be a crime, similar to the Kiev Maidan,” the Communist chief said. A short time later, the Communist Party forwarded an enquiry to the Federal Bodyguard Service or FSO – the agency responsible for personal security of top officials that oversees all works in the Moscow Kremlin as this site is the official residence of the Russian president.FSO’s spokesman Sergey Devyatov has assured MPs and the general public that the “ruby stars” on the Kremlin towers will remain in place. “The star is where it used to be, it is simply covered with scaffolding. There are no plans whatsoever to replace it with an eagle. This is not in the tower restoration plan,” the official told the Interfax news agency. Devyatov noted that during the whole period of the Kremlin stars’ existence the decorations were removed from the towers only once – in 1946 to repair the damage inflicted by Nazi bombs during the war. Between 1941 and 1945, the stars were wrapped in canvas for camouflage, but the German raids on Moscow were so intense that the canvas protection was not sufficient. Russia used the Byzantium double-headed eagle as its coat of arms from the late 15th century. In the 17th century, the brass guided eagles were installed on the towers and principle buildings of the Moscow Kremlin and remained there until the mid-1930s when the Bolshevik government ordered them to be replaced with red stars. After the collapse of the Soviet Union, Russia returned to its old coat of arms. 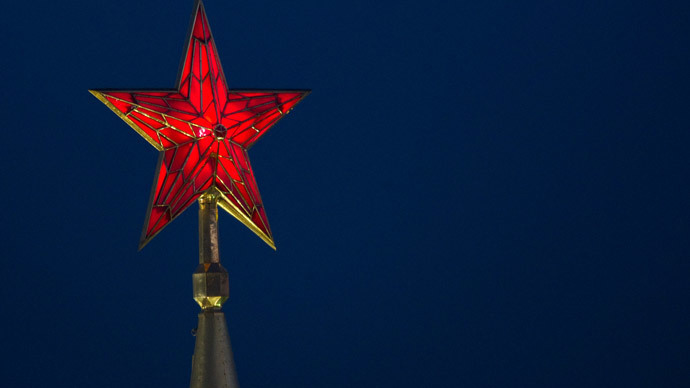 However, the authorities chose to keep the red stars in their places because by this time they had become a symbol of Moscow, and also not to stir up class tensions in society.